Following the instant success of the first edition replica of Winnie-the-Pooh, this gorgeous collectible edition of The House At Pooh Corner completes the set of A. A. Milne's beloved books about Winnie-the-Pooh and friends. For over ninety years, Winnie-the-Pooh and his friends--Piglet, Owl, Tigger, and the ever doleful Eeyore--have endured as the unforgettable creations of A. A. Milne, who wrote this book for his son, Christopher Robin, and Ernest H. Shepard, who lovingly gave Pooh and his companions shape through his illustrations. Now fans can continue to celebrate the legacy of Pooh with a beautiful new gift edition. 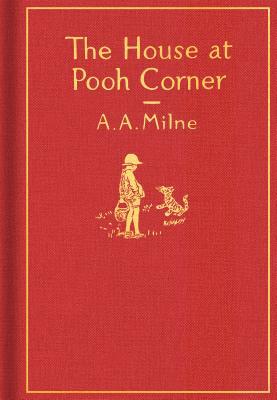 Crafted as a replica of the first American edition of The House At Pooh Corner, published in 1928 by E. P. Dutton, this elegant edition features a textured case, gold foil stamping, and illustrated endpapers. It is the ideal gift for both new readers and passionate collectors and is the perfect companion to the Classic Gift Edition of Winnie-the-Pooh. A. A. Milne was born in England in 1882, the third and youngest son of London schoolteachers. As a boy he wrote verses, parodies, and short humorous pieces for his school’s paper. He went on to study at Cambridge. In 1903 he left school to write. Before long he was supporting himself on his earnings, and became an editor at Punch magazine. In 1913 he married Dorothy de Selincourt. He began his military service in 1915 in Europe. During this time he wrote three plays, all of which were produced on the London stage. Christopher Robin Milne was born in 1920. It was Christopher’s toy bear, pig, donkey, tiger, and kangaroo that became the inspiration for the famous Pooh books. A. A. Milne wrote more plays, a novel, his autobiography, and political nonfiction, although he is best remembered for Winnie-the-Pooh, The House at Pooh Corner, When We Were Very Young, and Now We Are Six. Milne died in 1956. Ernest H. Shepard was born in 1879 in London. His father was an architect and his mother, who died when he was ten years old, was the daughter of a notable watercolorist. It was she who first encouraged young Ernest to paint and draw. Art became Ernest's passion, and after attending Heatherley's Art School and the Royal Academy Schools, Shepard supported himself by drawing for the illustrated papers and by illustrating books. In 1903, Shepard married Florence Chaplin. Florence was a mural painter and fellow student at the Academy. The Shepards had two children: Graham, who was killed in World War II, and Mary, who later illustrated P. L. Travers’s Mary Poppins books. During World War I, Shepard served in France, Belgium, and Italy, attaining the rank of major. On his return to England, he continued with his art. He became a regular contributor to Punch, the classic British humor magazine, where he met A. A. Milne, a man who was to be instrumental to his career. Shepard was elected to the editorial board of Punch, and shortly thereafter, he agreed to do the illustrations for Milne's first book of verse, When We Were Very Young. The illustrations that Shepard created for all four of the Pooh books received worldwide acclaim. For the next 30 years, he continued to illustrate books for both adults and children. In 1973, for the first time, he added color to his drawings for Winnie-the-Pooh. Shepard ultimately donated several hundred drawings to the Victoria and Albert Museum in London. Ernest H. Shepard continued to pursue his love of drawing until his death in 1976.